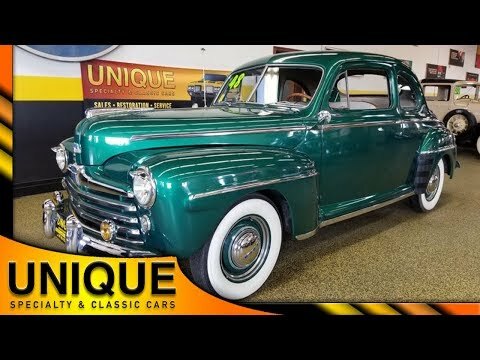 1948 Ford Super Deluxe Coupe that is still mostly a stock car. This car comes equipped with a Flathead V8 underneath the hood paired with a manual 3-speed on the column. This car has been upgraded to a 12V battery as well. The Super Deluxe comes with extra chrome and brightwork which makes the green color pop that much more. The chrome and brightwork is in good shape for it's age and provides a solid look as well as straight body lines. This Ford is riding on wide whites and Ford wheel covers to add to the classic look of the time. Rear dual exhaust equipped. This car is a West Virginia car and it shows well. Interior has a tan tri-tone look to it with cloth interior and door cards as well as the original headliner. This car retains the stock steering wheel with a wheel cover. Odometer reads 26,348, but we cannot confirm those miles to be accurate. Great starting and running classic Ford!